Our “Your Layover Guide” series features airports and destinations around the world where you’re likely to be stuck between flights, offering tips on navigating and spending time in the airport, as well as some things to do if you find yourself with time to explore the nearby city. 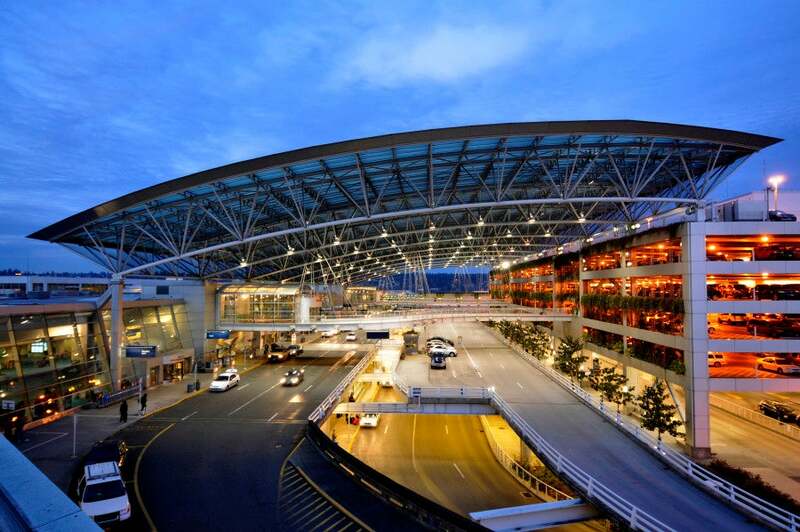 Today, TPG Contributor (and longtime Portland resident) Jessica Spiegel guides us through the award-winning Portland International Airport. View of Mt. Hood near PDX. Photo courtesy of the Port of Portland. 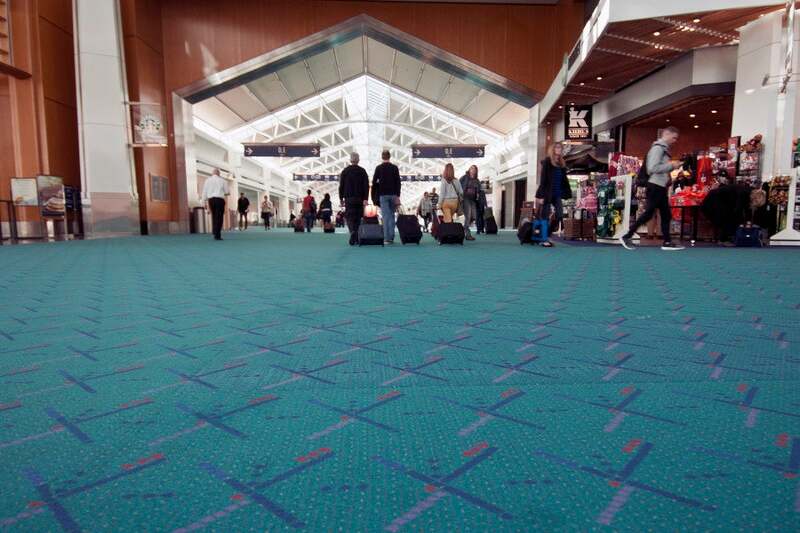 Even if you’re only remotely interested in travel, chances are good that you’ve heard about one aspect of Portland International Airport (PDX) in the news recently — namely, its carpet. Portlanders have a quirky love for both their carpet and their airport, but they’re not alone; PDX has been in Condé Nast Traveler‘s Business Travel Awards numerous times, and was voted Best US Airport by Travel+Leisure readers in 2013 and 2014. 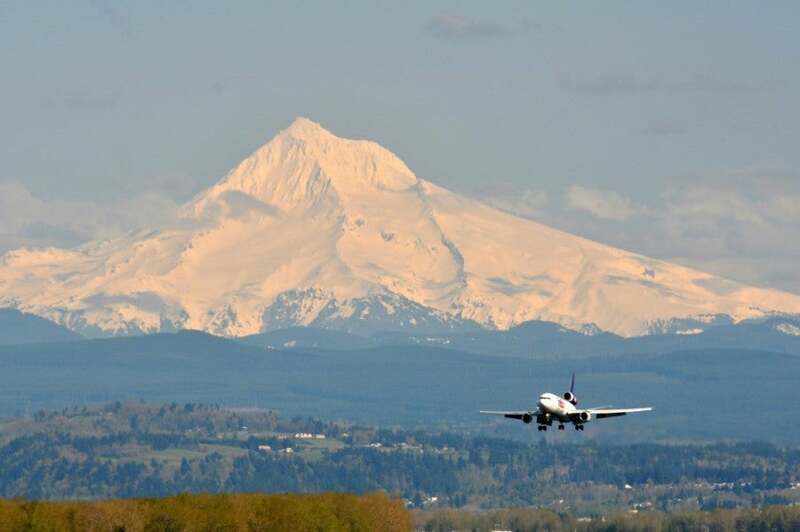 Portland International Airport is served by 14 domestic and international airlines (including Alaska, American, Delta, United and JetBlue) which fly to a combined 50 domestic and seven international destinations. There’s only one terminal, shaped a bit like an uppercase H, with five different concourses (A through E) along two wings of the building. There are two security checkpoints, and most people head for the one closest to their gate, but there’s a post-security “Concourse Connector” walkway — so choose the shorter security line, no matter where it is. Soaring covered walkway between the terminal and the parking garage. Photo courtesy of the Port of Portland. PDX has offered free Wi-Fi for at least a decade now, carrying the torch that so many other airports have decided (sometimes reluctantly) to follow. In other words, although you might just take it for granted that the airport should offer free Wi-Fi, you can be extra-appreciative that PDX agreed with you way back in 2005. The Port of Portland, which operates PDX, maintains a number of art exhibits and installations at the airport as part of its Arts and Entertainment Program. The work of regional artists is showcased in five different locations throughout the airport, and local musicians often perform live to entertain passengers. In addition to the rotating exhibits, there is also an enormous carved wooden cuckoo clock just past one of the security checkpoints. The “Portland is Happening Now” clock — the tallest freestanding cuckoo clock in the country — is covered with Portland imagery, including the Portlandia statue, Mt. Hood, tons of roses, the Unipiper, beer and bicycles. The whole thing was carved with a chainsaw by an Oregon artist. 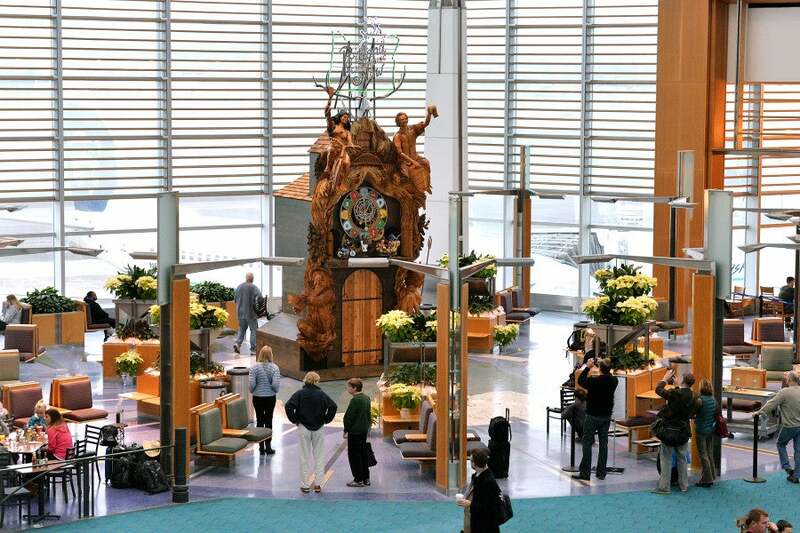 The “Portland is Happening Now” Cuckoo Clock at PDX. Photo courtesy of the Port of Portland. As mentioned, the PDX carpet has taken on a life of its own. The Port of Portland didn’t set out to create a city symbol or something that would go viral. But the teal carpet with its geometric design, originally installed in the late 1980s, has become the iconic “I’m home” photo for locals upon landing at PDX. The “foot selfie,” as some call it, is now such a big deal that PDX has placed signs around the airport inviting travelers — with big yellow dots on the floor and foot outlines (in case you don’t know where to put your feet) — to tweet photos with the #pdxbestairport hashtag. But even before the airport took this step, there was a PDX Carpet Instagram account, Facebook fan page, and popular hashtag that the Port of Portland had absolutely nothing to do with. The old PDX carpet, which is disappearing from the airport. Photo courtesy of the Port of Portland. When PDX announced they’d be replacing the carpet starting in 2015, there was enough of an outcry that some local businesses were allowed to purchase sections of the old carpet to repurpose as art and household items which, yes, Portlanders seem to be pre-ordering in droves. After you’ve snapped your own foot selfie, you might consider taking home a #PDXcarpet memento in the form of a T-shirt, sticker, mug, keychain, pair of socks, or even a beer with the design on its label — all of which are available at shops inside the airport. Shopping once you’re in the Portland area? Bricks and Minifigs makes custom-painted LEGO tiles in the PDX carpet pattern. Portlandia really does begin at the airport, in the most adorable ways possible. There is one luggage storage company at PDX — Luggage Storage and Logistics — located just past baggage claim carousel number 10 on the lower level. It’s open daily from 8am-midnight. Travelers can call 503-284-1292 for price quotes in advance (some have found the fees “negotiable”), but there aren’t any per-bag fees listed on the PDX website. Powell’s Books outpost at the airport. Photo courtesy of the Port of Portland. 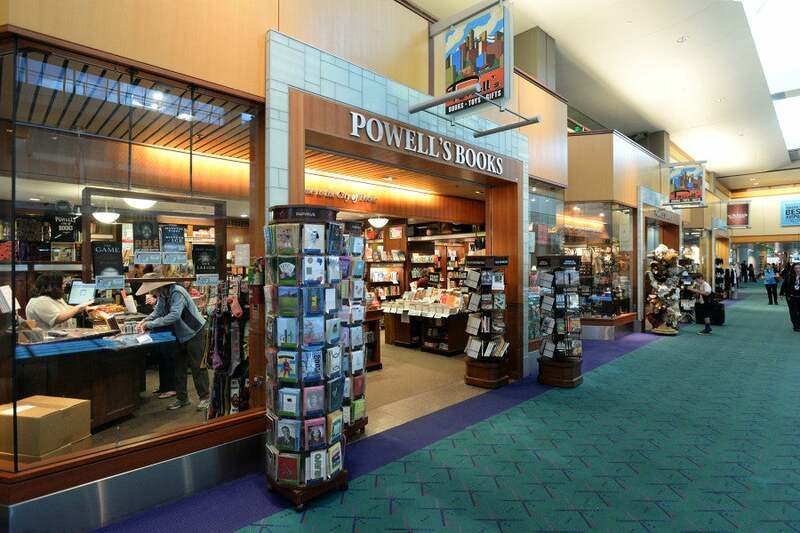 The majority of the shops at Portland Airport are pre-security — including an outpost of iconic Portland institution Powell’s Books, selling an assortment of both new and used titles just like the huge flagship store downtown. There are other Oregon-centric shops along the wide walkway, too, like Made in Oregon (crammed wall-to-wall with items that are, you guessed it, made in the state — it’s the go-to for gifts) and Pendleton Woolen Mills. One of Portland’s craft distillers even has an airport presence — House Spirits Distillery, makers of Aviation Gin and Westward Oregon Straight Malt Whiskey, have a kiosk post-security near Concourse D.
Food carts at PDX, pre-security. Photo courtesy of the Port of Portland. Hometown favorites are represented in the restaurant selection at the airport, too, alongside the usual fast food options. Portland’s Flying Elephants Deli, The Country Cat, Rose’s Bakery, Petite Provence and Laurelwood Pub all offer the same great food (and craft beer, in the case of Laurelwood) at the airport that they do in the city. The Oregon coast brings some of its best to PDX, too, in the form of Mo’s famous seafood and chowder and Rogue Ales Public House. 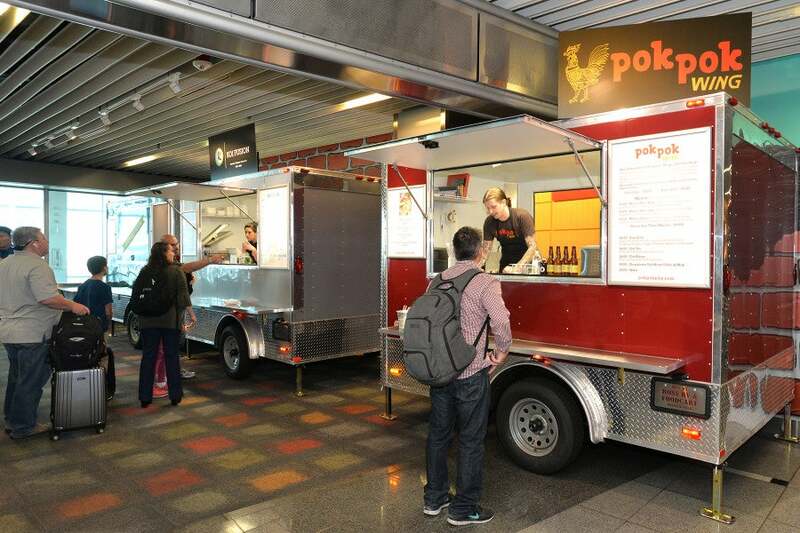 But perhaps the most Portland dining option at the airport is the little food cart pod (pre-security), featuring some of the city’s top food cart purveyors — Koi Fusion and Pok Pok. There are three airline lounges at PDX. Delta’s SkyClub is on Concourse D between gates D5 and D7 (open Sun-Fri 5am-12:20am, Sat 5am-11:30pm; $50 at the door without Delta SkyClub membership), the United Club is on Concourse E across from gate E1 (open daily 4:30am-11pm, $50 at the door without elite status or United Club membership), and Alaska’s Board Room is on Concourse C between gates C4 and C6 (open daily 5am-9pm, $45 at the door without a Priority Pass or Board Room membership). MAX station at PDX. Photo courtesy of the Port of Portland. 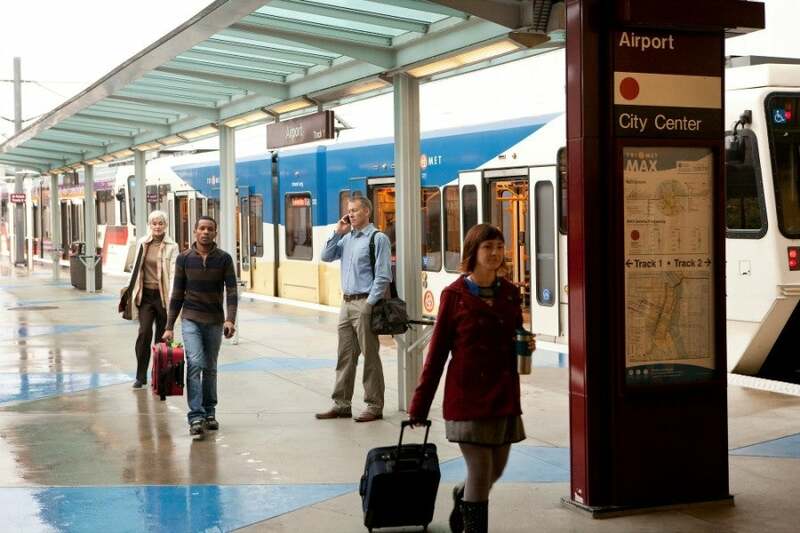 The easiest and cheapest way to get into Portland from the airport is via MAX, the city’s light rail system. The Red Line from PDX to downtown takes just under 40 minutes. A one-way adult ticket is $2.50, which is valid for 2.5 hours, or you can buy a day pass for $5. The MAX station is on the lower level at the south end of the baggage claim area. If you’d prefer a taxi, head outside of the terminal on the baggage claim level to the center island. There’s no flat fee for airport-city trips, but the fare is usually around $35 one-way, depending on traffic. To get back to the airport, your best bet is to call one of the city’s taxi companies (listed on PDX’s website) for a pick-up (hailing a cab is nigh unto impossible downtown, since they’re not exactly plentiful). There is an express shuttle — the Downtown Airport Express by Blue Star — that runs every half-hour from the airport to downtown. Tickets are $14 one-way, or $24 round-trip. Both Lyft and Uber became legal in Portland in the spring of 2015, and shortly thereafter were approved by the Port of Portland to pick up passengers at the airport — so you can arrange a ride with either service from your phone when you land. Cars from both companies wait near the taxi stand on the lower roadway outside baggage claim. Fares vary, but are usually less than a traditional taxi. If you’ve got a little more time and want to explore further afield, the rental car companies with on-airport locations are Avis, Dollar, Enterprise, Hertz and National. Alamo, Budget, Payless and Thrifty have off-airport locations with shuttles. Portland is a different place depending on the weather. On a nice day, you can’t do much better than to head straight for Tom McCall Waterfront Park on the west side of the Willamette River — it’s what many locals do when the sun shines. There’s a paved walking path along the river, connected to a similar path on the opposite side of the river — the Eastbank Esplanade — by crossing two of the city’s many bridges. Part of Portland’s Waterfront Park, as seen from the Eastbank Esplanade. Photo courtesy of Shutterstock. On weekends from March through Christmas Eve (rain or shine! ), take a detour to explore the Portland Saturday Market stalls, which spill over both sides of Naito Parkway next to Waterfront Park tucked underneath the Burnside Bridge. From there, if you’ve still got time (and luggage space), walk up to the Powell’s Books flagship store (it occupies an entire city block) on Burnside Street at 10th Avenue to satisfy your inner book nerd. If shopping or books aren’t your thing, you can seek tranquility at the pint-sized Lan Su Chinese Garden in the Old Town Historic District on NW Everett Street. It’s enclosed within one (small) city block, exceptionally beautiful, and there’s a two-story teahouse inside with lovely snacks. Both the Chinese Garden and Powell’s are good options during dreary weather, too. There are several food cart pods downtown, including the popular (and huge) one that spreads out from 10th and Alder, so you can grab a bite with the locals before you head back to PDX. 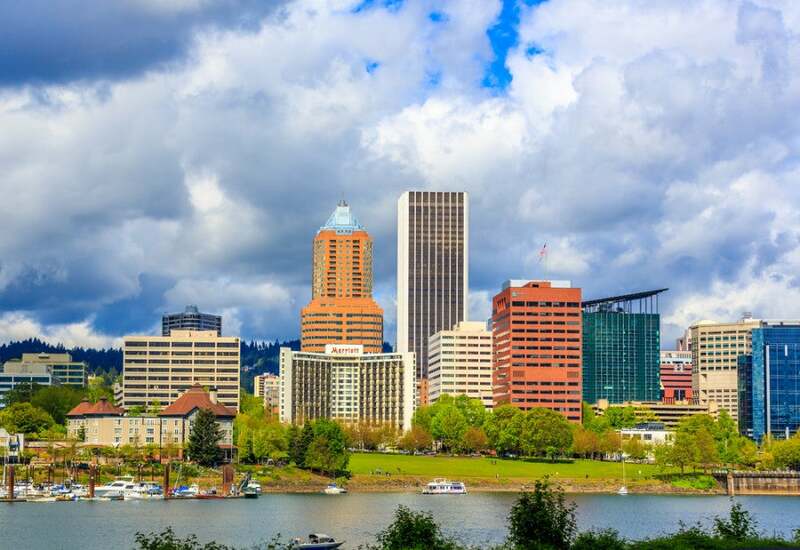 In addition to the activities listed above, with a full day in Portland you can explore points further away from downtown. Take the MAX Red or Blue Line up to Washington Park in the West Hills overlooking downtown for a visit to the International Rose Test Garden, the Japanese Garden or the Oregon Zoo. Nearby, you can check out Portland’s historic Pittock Mansion — a 22-room estate built in 1909 for the founder of The Oregonian newspaper. From many places in Washington Park, the view over downtown Portland with Mt. Hood (and often Mt. St. Helens) on the horizon is pretty spectacular. View overlooking Portland from Washington Park. Photo courtesy of Shutterstock. 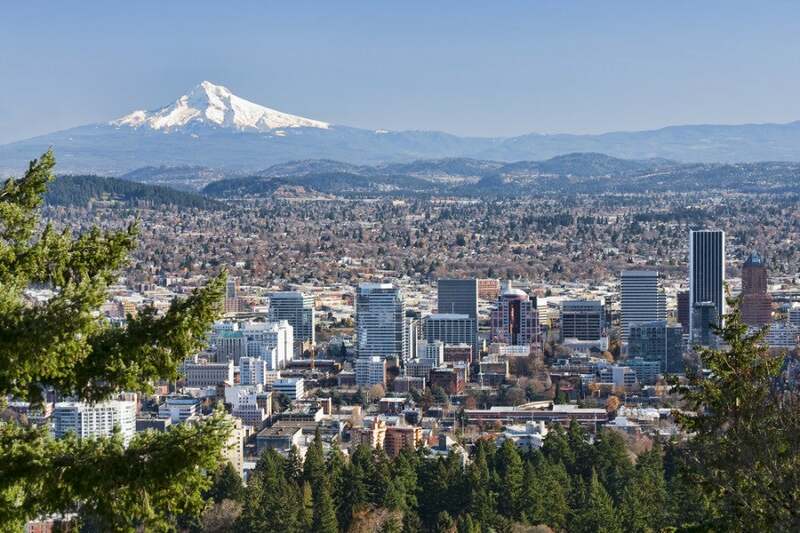 Just north of Pittock Mansion is Forest Park, the largest urban park in the country, which stretches from the West Hills into the northwest residential area near downtown Portland. It’s exceptionally popular with locals for hiking, jogging and mountain biking. If you’re traveling with kids, there are few places better suited to entertain and educate (while keeping adults engaged) than OMSI, the Oregon Museum of Science and Industry, on the east bank of the Willamette River. There are permanent hands-on science displays and exhibits as well as temporary exhibits that rotate regularly, an OMNIMAX theater and a planetarium. The USS Blueback submarine is permanently moored right next to OMSI as a museum. In good weather, another great option is to sign up for a jetboat tour of Portland — they depart from just outside OMSI. Just know that you’re likely to get a little wet, so plan to change clothes before you get back on the plane. There are lots of hotels near PDX with shuttle service to/from the airport, but unless you’ve got a really late arrival or really early departure you’ll get more out of your stay if you choose a hotel downtown. The famous Portland sign downtown. Photo courtesy of photo.ua / Shutterstock.com. Near the airport, Starwood has a Sheraton (from $135 or 7,000 Starpoints points/night) and an Aloft Hotel (from $169 or 7,000 Starpoints points/night); Hilton offers a Hampton Inn (from $159 or 20,000 HHonors points/night) and an Embassy Suites (from $174 or 30,000 HHonors points/night); Marriott has a Residence Inn (from $149 or 25,000 Marriott Rewards points/night) and Hyatt has the Hyatt Place (from $209 or 8,000 Gold Passport points/night) — among many others. The Aloft, the Residence Inn and the Hyatt Place are located in Cascade Station, a complex of (tax-free!) shops and restaurants near the airport. Downtown, one of Portland’s old-guard hotels will make you feel like you’ve gone back in time to when a luxury hotel meant overstuffed furniture, dark wood and grand staircases. The Heathman Hotel (from $219/night) is an Amex FHR property, providing perks like upgrades, room credits and late check-out to holders of the Amex Platinum and Business Platinum when booked through the Amex FHR portal. For more contemporary renditions of class, consider The Nines (from $279 or 12,000 Starpoints/night, and also listed with Amex FHR), Kimpton’s Hotel Monaco (from $245/night — read more about Karma Rewards) or the Hotel Lucia (from $249/night). 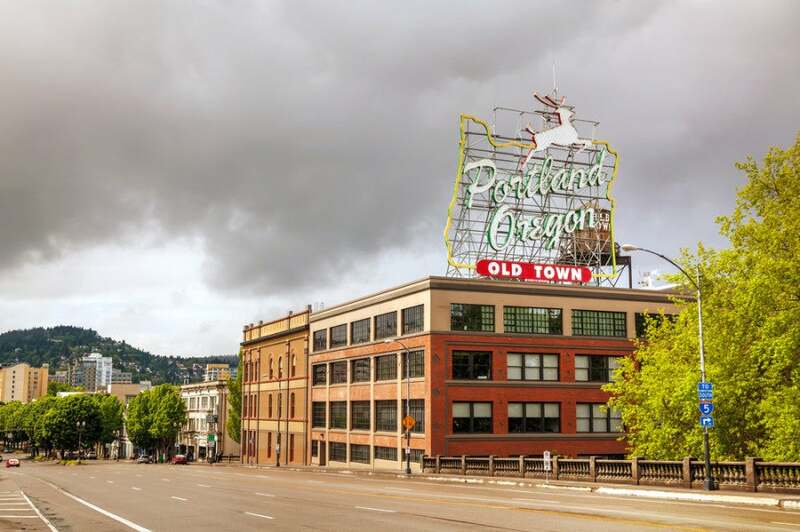 And if you want a boutique hotel that screams Portlandia, look no further than the Ace Hotel (from $185/night).